Craig has been with Friedman Williams since 2010. 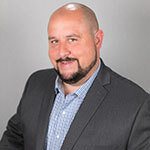 With over fifteen years of contract / temporary staffing experience, Craig leads the recruitment and sales efforts for the Consulting Services division whose placements range from Fortune 500 companies to tech startups. The Consulting Services division was started by Craig and Jonathan Friedman to provide our clients with a service offering of high-volume temporary staff within the divisions of Information Technology, Accounting and Finance and Administrative Support. Having started his career in recruitment technology, Craig has been an integral part in keeping FW at the leading edge of technology. He has been involved with the implementation and selection of technologies utilized firm-wide and consistently looks at ways to improve our digital brand. Craig is a graduate of Kean University with a degree in Music and has been a working musician for the past 20 years.